Make the cakes: preheat the oven to 180°C/350°F. Butter two 20cm (8in) round cake pans, line the bottom of each pan with a round of baking paper and butter the paper as well. Combine the almond meal, flour, sugar, baking powder, and salt in a large mixer bowl. With the mixer on low speed, blend well. Add the sour cream and butter and, still on low, blend to incorporate. Raise the speed to medium and beat until light and fluffy, about 2 minutes. Put the whole egg and yolks in a medium bowl and whisk together, then whisk in the almond and vanilla extracts. Add the mixture to the batter in 2 or 3 additions, scraping down the sides of the bowl after each addition and beating only until the eggs are incorporated. Divide equally among the prepared cake pans. Bake the cake layers for 25-30 minutes or until risen and golden and a toothpick inserted in the center comes out clean. Cool completely in the pans over a wire rack. While the cakes bake and cool, make the lemon curd: put the sugar and cornstarch in a small nonreactive saucepan and whisk to blend. Add the lemon juice and eggs yolks and whisk until smooth. Bring to a full boil over medium-low heat, whisking constantly. Allow to boil for a full minute, still whisking. Pour through a mesh strainer into a glass dish. Whisk in the butter, lemon zest, vanilla and salt until blended. Cover with plastic wrap, pressing it down onto the surface of the curd to prevent a skin from forming. Cool slightly, then refrigerate until very cold and set, about 2 hours. Stir well before using. Assembling the cake: turn out the first cake onto a serving plate and gently peel off the paper. Spread the preserves over the cake, then spread the lemon curd over the jam, right to the edge. Top off with the other cake layer, and remove the paper. Make the Amaretto glaze by sifting the confectioners’ sugar into a bowl. Add the amaretto and mix. Add about 1 tablespoon water a bit at a time–all may not be needed–to make a thick pasty glaze. Pour the Amaretto Glaze onto the center of the top layer and gently spread it to the edge, allowing it to slowly drizzle down the sides of the cake decoratively. 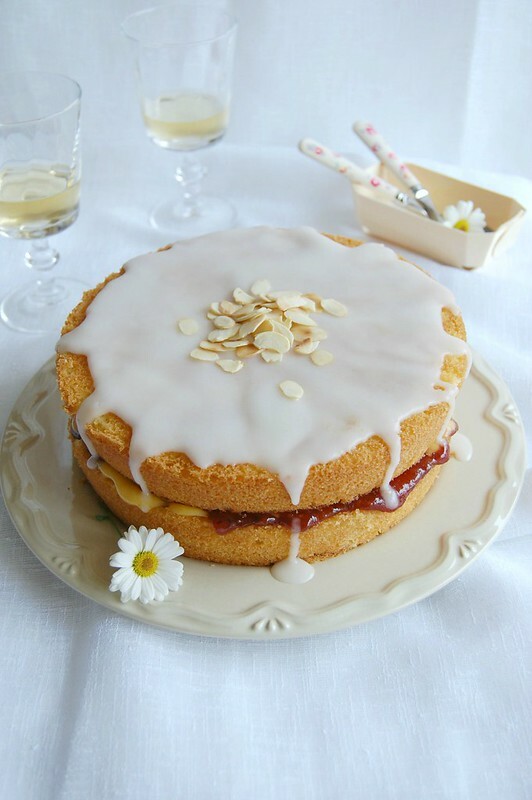 Sprinkle with the toasted sliced almonds over the top and set aside until the icing is set. Too pretty to eat - like just about everything you make! OH MY STARS!!!!!!!!!! This is epic! Qué maravilloso pastel, una preciosidad, seguro que delicioso para acompañar el té de la tarde!!! Enhorabuena!!! Can't make it unless metric measurements are converted. Why the combination?